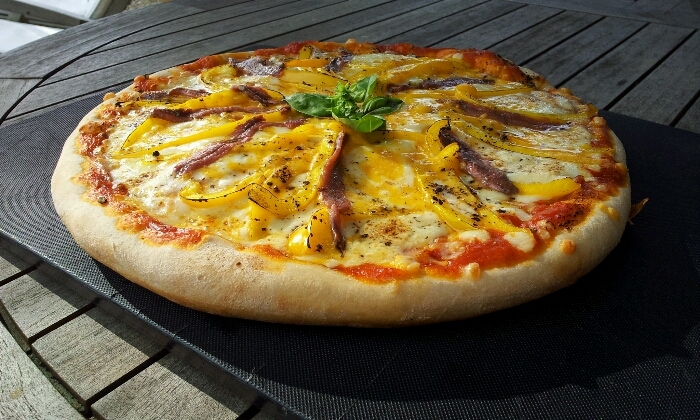 I like to cook pizza on the barbecue in summer using a pizza stone. If I am making a deep pan pizza, I let it rise in a pizza tin and put it onto the stone for about 5-7 minutes, then flip it directly onto the stone once the shape has formed to finish off cooking. If it is thin crust, then I go directly on the stone. Here, as shown above, it is fairly loaded (yellow peppers, chopped ham, two cheeses and anchovies), it is best to start with the tin. I like to cook it at around 160°c /325°f on the barbecue dial as the stone will be hotter (always preheat the stone). It will take 20minutes in all, but keep checking and turning at the end. 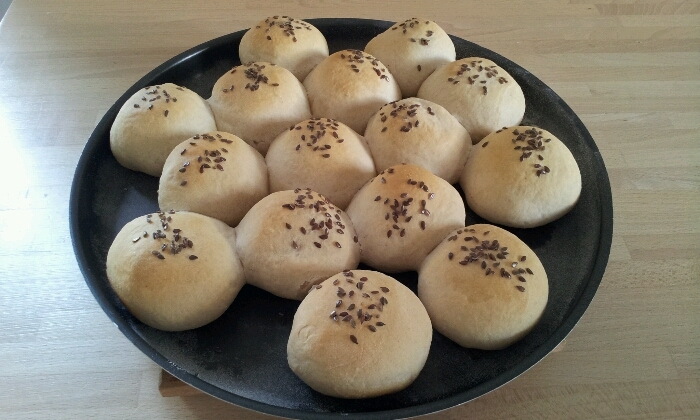 If any left over dough, you can make small rolls as I did. Rub the yeast into the flour. Add the liquids including the honey and olive oil and once mixed, add the salt. You must knead for a solid 10 or more minutes. Let rise for an hour, then shape into pizzas or loafs and let rise for another hour.